To make the stock, rinse the bones and beef under cold running water and trim off excess fat. In a large stockpot, combine the bones with water to cover. Place over medium heat, bring to a boil, and cook for 10 minutes. Drain. Add fresh cold water to cover by about 2 inches and return to a boil. Using a skimmer, remove any foamy scum that rises to the surface. Continue cooking until the foaming stops, about 15 minutes. overnight until needed. Season the stock lightly with salt or fish sauce and continue to simmer the stock until it is well flavored, 6-8 hours longer. When the stock is ready, remove from the heat and let cool for a few minutes. Refrigerate overnight. When the stock is well chilled, remove any fat that has solidified on the surface. Rinse the raw beef under cold running water and pat dry. To facilitate slicing, wrap the beef in plastic wrap and place in a freezer until very cold but not frozen hard. Transfer the stock to a large saucepan, place over medium-high heat, and bring to a boil, then reduce the heat to maintain a simmer, cover, and keep warm while you prepare the remaining ingredients. Prepare the noodles as directed and let stand in cold water until serving time. Prepare and arrange as many of the additions and seasonings as you wish in the bowls. To serve, drain the noodles and place alongside the simmering broth. 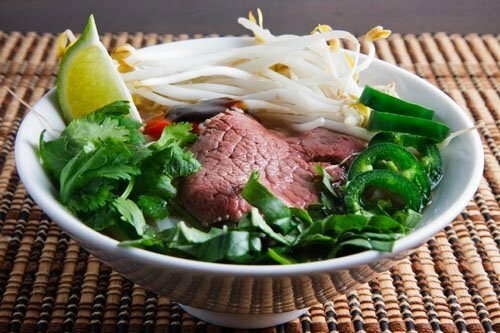 Divide noodles, chuck, raw beef, and bean sprouts among large warmed soup bowls. Ladle the hot stock over the ingredients: it will quickly cook the raw beef slices. Serve immediately.